By Tom Kertscher on Monday, September 14th, 2015 at 1:17 p.m.
As he aims to revitalize his drive for the Republican presidential nomination, Wisconsin Gov. Scott Walker is proposing to abolish unions for federal workers. Such a move would go even further than Walker did with Act 10, the 2011 state law that crippled public-sector unions in Wisconsin and helped make him a national political figure. Walker is scheduled to make the proposal during a town hall event in Las Vegas that is set for 5:30 p.m. Central time on Sept. 14, 2015. Here’s a look at some of the union-related claims made by Walker, or about him, that have been fact checked by PolitiFact Wisconsin. On the campaign trail, Walker often casts himself as the most-tested presidential candidate, citing 100,000 protesters who descended on Madison during debate over what became Act 10. He went too far with a July 2015 claim, however, when he said his political opponents "brought 100,000 protesters into our state." We rated his statement False. 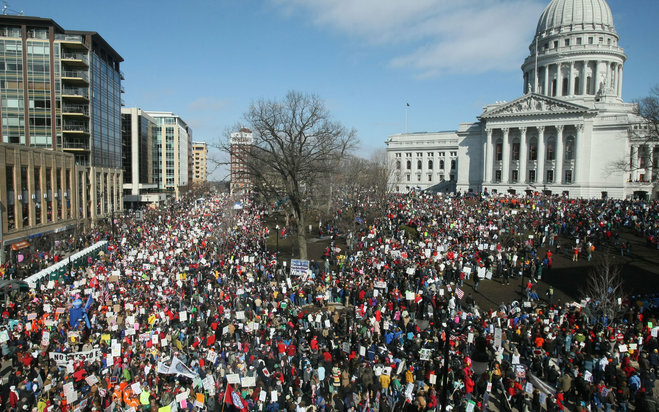 In early 2011, tens of thousands of protesters -- and perhaps as many as 100,000 on some days -- participated in daily demonstrations near the state Capitol. But there is no evidence to indicate that so many were from outside of Wisconsin. In September 2015, Facebook posts claimed Walker had said that "labor unions don’t deserve to have a national holiday" due to their damage to the economy, and the holiday "should be replaced by Patriots Day, celebrated every year on 9/11." Our rating was Pants on Fire. Walker never said such a thing. The Wisconsin AFL-CIO union said in July 2015 that Walker’s 2015-’17 state budget "includes no weekend for workers." A provision inserted into the budget that Walker ultimately signed permits employees in certain industries -- a fraction of all workers -- to voluntarily work seven days in a row. We rated the claim False. In June 2015, Walker made a statement that he has repeated often during the campaign -- that thanks to Act 10, scores in Wisconsin on the ACT college entrance exam "are now second-best in the country for states where more than half the kids take the exam." Our rating was Mostly False. Wisconsin's rank moved from third to second in 2012, the year after the Act 10 was adopted. But the rank didn’t improve because of an improvement in Wisconsin’s score and there is no evidence that Act 10 affected the ranking. Walker said in July 2014 that Act 10 saved state taxpayers "some $3 billion." We rated the claim Mostly True. Requiring most state and local government employees to contribute more to their pensions has saved public employers more than $3 billion. But those costs haven’t simply been eliminated; they’ve been taken on by public employees, who are also taxpayers. In 2013, Walker said President Franklin Delano Roosevelt "felt there wasn’t a need in the public sector to have collective bargaining because the government is the people." We rated the claim True. We found that Roosevelt saw a "logical place" for unions in government affairs, but the most compelling evidence suggests he drew the line at collective bargaining with them. Defending Act 10 in 2012, as he prepared to face a recall election, Walker stated: "We gave every public employee in the state the freedom to choose whether or not they want to be in a union." The law applies to most state and local public employees, but police, firefighters and other public safety workers are exempted. So, our rating was False. During the heat of the battle over Act 10, in February 2011, Walker said on NBC’s "Meet the Press": "Most federal employees do not have collective bargaining for benefits, nor for pay." We rated his statement True. Some federal workers have collective bargaining rights for benefits and pay, but most do not. The same month, Walker claimed he had campaigned for governor in 2010 on his collective bargaining reforms "all throughout the election." That received a rating of False. Walker did not go public with even the bare-bones of his multi-faceted plans to sharply curb collective bargaining rights.